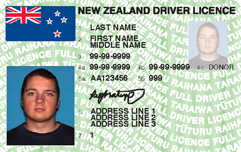 The New Zealand driver's licence system is a graduated system, which has been in place (with modifications, such as the L-plate requirement) since 1987. It consists of three phases for a car licence, each with varying levels of conditions. A New Zealand driver's licence allows the holder to drive a moped, tractor, or all-terrain vehicle as well as a car, however, motorbikes and heavy vehicles require separate licences. Upon passing the respective test for each stage of the system, the successful applicant is given a plastic card which contains a unique identifying number, date of birth and photograph of the holder. Apart from passports and a special-purpose 18+ card, a driver's licence is the only legal form of ID for buying alcohol, tobacco and fireworks in New Zealand. Visitors to New Zealand who hold overseas drivers licences may be required to take a driving test before they qualify for a full New Zealand licence. However, those from countries with similar road rules are only required to take a theory test (similar to the learner licence test) within a year of arrival; until this time they may continue to drive on their foreign drivers licence provided it is either written in English, or they have an authorised English translation available. 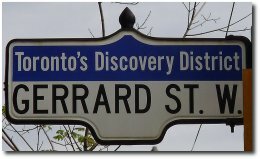 Gerrard Street is a street in Toronto, Ontario, Canada. It consists of two separate parts, one running east from University Avenue for 6 km to Coxwell Avenue, and the other starting 300 m north along Coxwell and continuing east for another 4 km to Clonmore Avenue (between Victoria Park Avenue and Warden Avenue). In the vicinity of Coxwell Avenue the southern piece of Gerrard Street is frequently referred to as Lower Gerrard, and the northern piece is referred to as Upper Gerrard. Phahurat or Pahurat, often known as Thailand's Little India, is an ethnic neighborhood surrounding Phahurat Road in Phra Nakhon District, Bangkok. The area that would become Phahurat was an enclave of Vietnamese immigrants who came to Siam during the reign of King Taksin (1768-1782). In 1898, a fire broke out and paved way for a road which was named "Phahurat" by King Chulalongkorn in remembrance of his daughter Princess Phahurat Manimai who had died at the age of 10. Many of today's Phahurat residents are of South Asian descent. A Sikh community settled down in the area a century ago and established a textile trading center that is still thriving today. Their temple, the golden-domed Siri Guru Singh Sabha, is a landmark of Phahurat. In addition to the Sikh community, the neighborhood is also home to a number of South Asian Hindus and Muslims. Although the sprawling of Chinese shops from the nearby Chinatown are slowly spilling over into Phahurat, South Asian restaurants and businesses are still prevalent in the area. The area is also the site of some of the more unusual markets and shopping malls in Bangkok, including the sprawling Sampeng Market, the colonial-styled The Old Siam Plaza, and the new four-storey India. Chakraphet Road is well known for its Indian restaurants and shops selling Indian sweets. One of the best eateries in the area is the Royal India Restaurant, which serves north Indian cuisine and is justly famous for its tasty selection of Indian breads (Naan and Tandoori Roti). On the opposite side of Chakraphet Road from the Royal India is a Chinese temple. North of this temple, in a back alley on the west side of the road, is a large Sikh temple-turn left before the ATM Department Store to find the entrance. Visitors to the temple-reportedly the second largest Sikh temple outside of India-are welcome but they must remove their shoes and cover their head. If you arrive on a Sikh festival day you can partake in the langar or communal Sikh meal served in the temple. Several inexpensive Indian food stalls are found in an alley alongside the ATM department store. 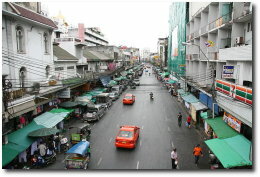 Behind the store, stretching westward from Chakraphet Road to Triphet Road, is the Pahurat Market. Pahurat is easily accessible by walk, after alighting from a Chao Phraya River Express boat at Tha (pier) Saphaan Phut, which is just to the north-west of Phra Phut Yot Fa (Memorial) Bridge. The Dhakeshwari temple was built in the 12th century by Ballal Sen, a king of the Sena dynasty, and many say the name of the city was coined after this temple. The current style of architecture of the temple cannot be dated to that period because of numerous repairs, renovations and rebuilding in its long years of existence and its present condition does not clearly show any of its original architectural characteristics. 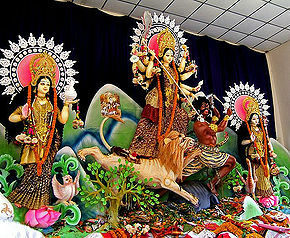 It is considered an essential part of Dhaka's cultural heritage. Many researchers say that the temple is also one of the Shakti Peethas, where the jewel from the crown of the Goddess had fallen. Although there is not enough historical context in order to establish this as a fact, researchers were directed to this site while trying to locate the particular Shakti Peetha. Since ages, the temple has been held in great importance. The original 800-year old statue was destroyed during the War of 1971. The temple was further damaged during the riots of 1989/90.